A plastic shoulder bag I put together lastnight for the St. Paul's Mind Body & Spirit Mini Expo February 27 and 28. 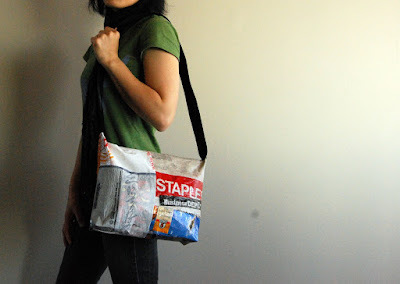 I won't be there but my plastic project bags will be! Go have a looksee if you are in the area!! you are so amazingly creative! Your projects look so good! Oh my god, this rules. Hey just keepin you on your toes..and i swear im not crazy.. but... you might wanna dbl check laws on the name branding part (the big staples sign) ..clearly this is the least of your worries!.... theres probably not a law youre breaking... but at the same time... that doesnt mean that it wont be created! BECAREFUL!! !